Wonderful outdoor shower - a must try! 2nd fl bdrm #1 w/Queen bed. Sitting area & skylight not shown. 2nd fl bdrm #2 w/Queen bed. Sitting area & skylight not shown. Beautiful First Encounter Beach is just 1.9 miles away! 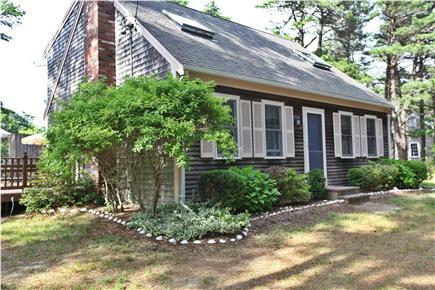 Enjoy it all in this wonderful, well maintained 4 bedroom, 2 bath home off the beaten track yet close to everything in a desirable bayside residential area of Eastham! A great spot for your fun family vacation, fall getaway, girls weekend, or hotel alternative for any special event! 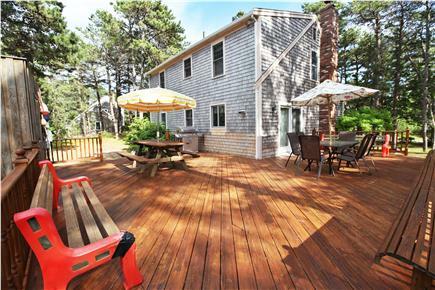 For the extended family and perfectly located on a private, dead end lane that ends at the Cape Cod bike trail: level .5 acre lot, four bedrooms, two bathrooms, very large wrap-around deck with an oversized outdoor shower, well appointed kitchen, living room, plenty of amenities and ample parking. Definitely a highlight, and with abundant seating, the deck is a great place for your family to congregate, relax, or enjoy a barbecue on our brand new Webber gas grill. (Our neighbors teased us when we first built it that you could land an airplane on it.) Don’t miss out on taking a shower in our outdoor shower…once you try it you’ll never want to take a shower inside again. Ours is quite large with a dry end for your clothes, and very private. There are a couple of great ponds nearby. Herring Pond is on the way to First Encounter Beach, a beautiful bay side beach that is perfect for families with young children...you can walk out pretty far when the tide is low and even at high tide there is little to no undertow. Wiley Park is a great fresh water pond with a sandy beach, shaded areas, dock, playground, bath house, and the ice cream truck stops by several times a day. All of these favorite beach spots are within 2 miles. The Cape Cod National Seashore is a bike ride away and is one of the top 10 most visited National Parks in the US… http://www.nps.gov/caco/index.htm. Enjoy the visitors center, guided walks, and guided talks/movies, besides spectacular beaches. We are only a couple of miles (and an easy bike ride) to beautiful Nauset Light Beach on the Atlantic Ocean — recently rated a “Top Ten Beach” in the world! 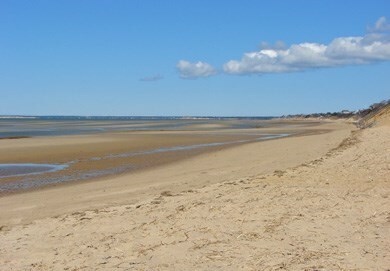 Coast Guard Beach, the shallow, warm beaches on Cape Cod Bay, and Eastham ponds are all a short drive. There are lots of great activities on the Cape and with neighboring towns like Orleans, Brewster and Wellfleet much of it is very close by. We have a binder in the house with flyers and restaurant menu’s from many of the places that we and our former renters have enjoyed. Nearby: biking, golf, fishing, whale watching, drive-in movie, flea markets, shopping, antiquing, miniature golf, hiking, kayaking, Audubon center, Rock Harbor and more...most less than 5 minutes away. Don't miss the Monday night concerts on Nauset Beach in Orleans…kids can dance barefoot in the sand around the gazebo where the musicians play. Eastham also has Monday night concerts at the windmill, and Chatham has a wonderful band concert in the center of town on Friday nights. Catch a game of the Orleans Firebirds, Cape Cod baseball league, or one of the many plays or concerts on the Cape each summer. 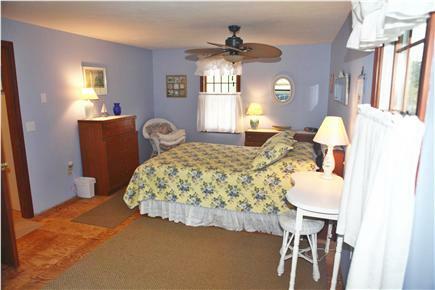 The two bedrooms upstairs are rather large, with queen beds in each one, sitting areas, ceiling fans, and skylights. 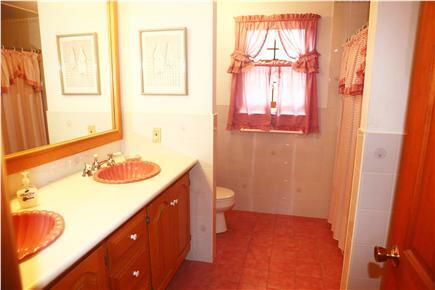 A full bath completes the floor plan. 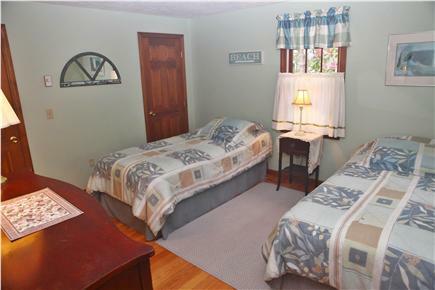 The first floor has one bedroom with a queen bed, and one bedroom with 2 extra long twin beds...both bedrooms have brand new hardwood floors. There is a new washing machine (2014) and a clothes line, no dryer. The baths are tiled. The kitchen appliances were recently updated, including a new stove, microwave and Keurig coffee maker in late 2014. Ours is a quiet, family-oriented neighborhood with several year-round families nearby. Our home is neat, clean and comfortable, and until recently only rented to repeat renters from 'back home'. Renters provide their own linens. Internet service is provided. There are no pets allowed and no smoking in the house please. Additional availability info: Rental by the night is available Off Season. This is a Saturday to Saturday vacation rental. Additional pricing info: $250 Security Deposit required plus MA Lodging tax = 12.45%. Also, ask for multi-week discount!, State and local taxes of 12.45% will apply. After years of renting on the Cape, we have finally found the perfect place to stay. 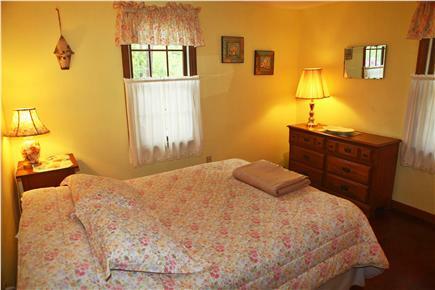 With plenty of bedrooms, we were able to accommodate our family and friends. 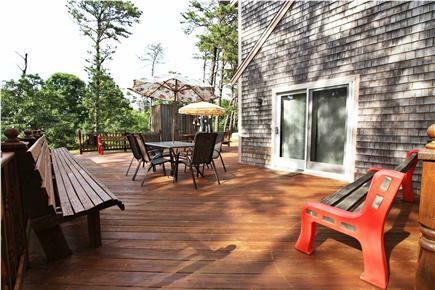 Also, the large deck was perfect for entertaining. From the outdoor shower to the two bathrooms, no one had to wait in line and we could be quickly out the door for a night on the town. Beaches, restaurants, and shops are close by so you don't have far to venture. This is now my home away from home. This is the Rental you want!! This is my 3rd review and it does not change! The house is immaculate and the owners are wonderful. The house is kept with pride and you do not have to worry about its cleanliness or unwanted insects. The owners will do all they can to make your stay the best, and each year you rent, you will find something new to make your stay even better! This year there were new kitchen chairs around the table. This is the place you want to stay! This is our 16th year renting this house and we never went to Coast Guard Beach. This beach is less than 5 minutes from the house and is the best beach on the Cape. No stairs, no rocks to navigate over to get to softer sand, and if you want to see seals, just walk down the beach and they are there in pods. My family stayed in this home multiple times. The house is very well taken care of. Every year there are some pleasant enhancements that we appreciate. There are new kitchen appliances, coffee machine, washing machine. 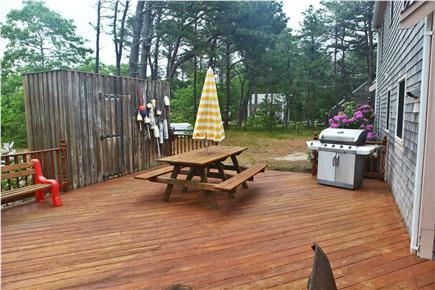 We love the enormous deck and the outside shower. The bedrooms are large, especially upstairs. We love the biking trail that the dead end of the street has access to. The beaches both bay and ocean are a few minutes drive. This is my 14th year renting this house, and for some of my family members they have rented this house for over 20 years. This year was one of our best stays on record! The location of this house is the best! We have children in our family that range from age 7 to age 16. The property is close enough for our big kids to catch the "big waves" at Marconi, and minutes away from the fresh water ponds, such as Wiley Park for the little ones. Let's not forget you can get on your bikes and be on First Encounter Beach in minutes to enjoy the Cape's bay side. When we needed a break from the beaches we could hop on the bike path at the end of the road to do some shopping or have ice cream in Orleans. Or we would hop in the car and head to the Atlantic Spice factory in Turo, as well as, head to Provincetown for more shopping and site seeing. Provincetown is only a 30 minute car ride away from the property. Jan and her family are wonderful to work with as the owners of the house. Their only goal is for you to have the best Cape vacation possible. They are constantly asking for feedback and suggestions. The best part about giving them feedback is that they actually use it to make your stay that much better the next year. They have upgraded several appliances in the kitchen, added WiFi, upgraded the screen doors, and there are ceiling fans in the upstairs bedrooms. They also supply box fans for the other bedrooms. This was greatly appreciated this year since the average temperature during the week of our Cape vacation was 90 degrees. 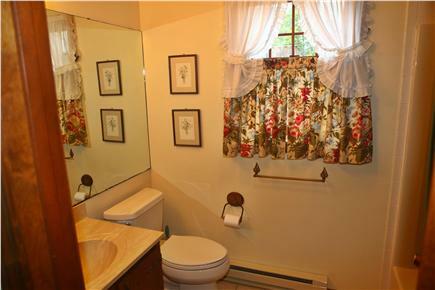 It is without reservation that I recommend this rental property to you for your vacation. Great property and neighborhood. We spent most of our time on the jumbo-sized deck (and using the gas grill). Upstairs bedrooms are large and lovely. Jan was very friendly and responsive. A great value for the money! The owner Jan was very easy to deal with. The house was clean, the upstairs bedrooms are huge. The deck and outdoor shower are amazing. Bike trail entrance at the end of the road, and some old bikes available to use in the basement. Overall, very impressed. We rented this home for a ladies' weekend several times and love it. It's comfortable and well kept, and it has all of the amenities we need. I especially like the spacious bedrooms that can accommodate everyone's luggage without feeling crowded. I also like that it is close to the bike trail for an early morning walk or ride. Jan and Ken are very personable and accessible by phone if you have questions. 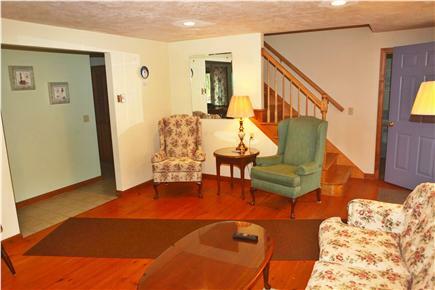 This is a nice retreat and reasonably priced. Like many of you we've been coming to the Cape each summer since we were kids. My brother Bill and I (Jan) are the original owners of this home, having bought it new in 1983 and we've made many improvements over the years. We've enjoyed having our extended family vacations here, and our hope is that you enjoy it just as much. Feel free to call us to find out more about our favorite Cape escape. We take pride in keeping a nice, clean home with many of the amenities that our guests are looking for in a beach house. Our outdoor shower and deck are very large, and probably what we get the most compliments about, besides the well-cared for condition of the home, and great location.